Le Pont des Arts in Paris is no ordinary bridge, it is one of the most romantic bridges in Paris, but it once was more well known for it status as the love lock bridge. Lovers would flock here from all over the globe to inscribe their names on a padlock. The act involved writing one another’s initials into the lock, fastening it to the metal railing then throwing the key into the river Seine below. In doing this you are sealing your love for each other forever! Unfortunately it was removed back in 2010 by the French government because of concerns on the impact and the visual appeal they had on its surrounding architecture and the city itself. 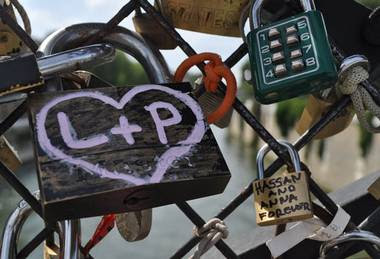 But no need for dispair as recently the Petit Pont de l’Archevêché has become the new hotspot for the love locks! I do wonder how long will they remain until they are once again removed and I hope I will get a chance to see this in person! However due to it’s popularity the French Government are looking at permanent fixtures for couples to cement their love upon – fixtures that wont detract away from the exceptional architecture! I adore the idea of a ‘love lock’ and what it represents. Personally I don’t see them as vulgar but as a symbol of love in a city that has always been, and probably always will be, the city of love. All I can say for now is that I hope they remain in place a little while longer because this has definitely made it onto my bucketlist!